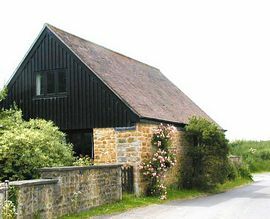 This is a 600 year old cruck barn, cleverly converted to retain as many original features as possible. 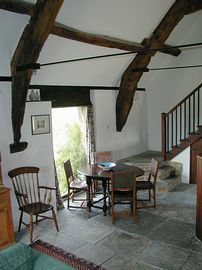 Wonderful old beams! It is set in pretty countryside next to a small working farm - the nearest small market town Castle Cary is about a mile and a half away. 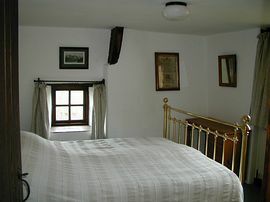 There is a ground floor bedroom with a magnificent Victorian brass double bed - the small bathroom is next to it. 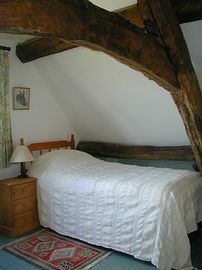 Upstairs the bedroom has two single beds - mind your head on the low beam! The location is brilliant for touring this unspoilt area - there are lots of things to see and do to suit all tastes. Nearby is a medieval bee house providing an additional bedroom with ensuite facilities which can also be rented if required. Very old building sympathetically restored. Pretty and quiet rural location. Directions are given at the time of booking. We are near Castle Cary. The rates vary according to the season - all electricity and gas is included. From £225.00 - £575.00 per week. 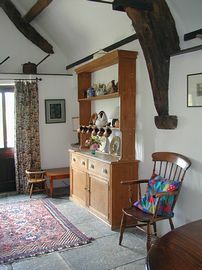 Short breaks minimum 2 nights from £25.00 per person per night. We have a flexible policy about changeover days - making it possible for visitors from abroad to take advantage of lower mid-week fares.